We’ve voted our way to very last match-up! After starting with boy names drawn from the sixteen most popular Name of the Day posts in 2018, we’re down to just two. But only two can compete for the championship this week, and next Saturday, we’ll learn which names join our past victors in the Winners’ Circle. 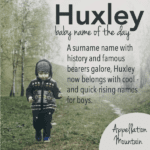 Torin took on Huxley, two modern names that feel far more mainstream today than they did just a few years ago. Here’s an interesting twist: Huxley ranks in the US Top 1000 and rising quickly, while Torin remains outside of the list. 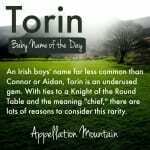 But it’s Torin that advances, with a commanding 71% of the total. 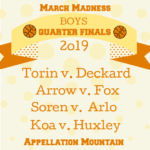 This makes me think that Torin is one to watch – not just for March Madness, but maybe for next year, too! In the second match-up, Fox faced Arlo. 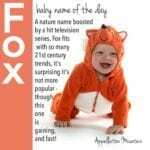 Both names appear in the current Top 1000, but Fox is a recent arrival, debuting in the US Top 1000 just two years ago. This time, the results matched my expectations. 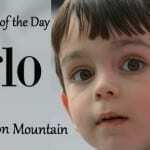 Arlo carried the day, with 66% of the vote. It returned to the US Top 1000 seven years, and parents have really warmed to Arlo’s homespun, upbeat vibe. 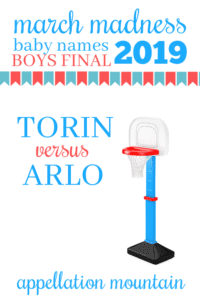 Here’s an interesting fact: Arlo was also a finalist in 2018 and 2017, falling to Rowan last year – narrowly – and Leo the year before. Read more about Fox here. 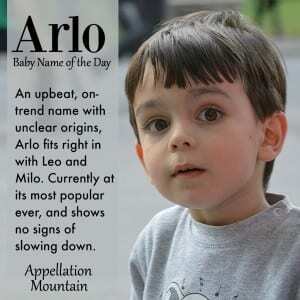 Read more about Arlo here. And now it’s time for one last contest. Your votes determine the name that will join past champions Nathaniel, Arthur, Archer, Everett, Finn, Theodore, Leo, and Rowan. Voting will remain open through Thursday, March 28, 2019. Check back on Saturday, March 31st and we’ll announce this year’s March Madness Baby Names champs! Interesting that Torin has seemingly come out of nowhere. I know one Torin (different spelling) who is 3 years old, and that is the first name I ever heard the name. I hadn’t heard it again anywhere until this poll. To be honest, I think I dislike both of these . . . equally. The girls’ races have more appealing contenders.